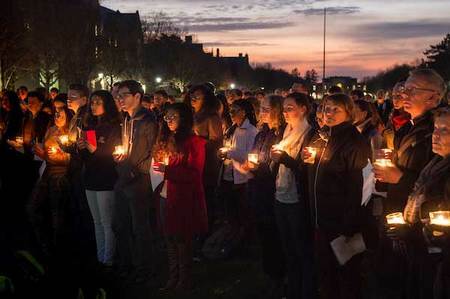 Following an acrimonious election season, the University of Notre Dame invited the campus community to take part in an interfaith prayer service on Monday (Nov. 14) to pray for peace for the nation, wisdom for leaders and care for the most vulnerable. Led by President Rev. John I. Jenkins, C.S.C., the candlelit service included readings, prayers and songs by a number of interfaith representatives from throughout the University, including a passage from the Quran read by Ebrahim Moosa, professor of Islamic Studies in the Kroc Institute for International Peace Studies, department of history and the Keough School of Global Affairs. The service was held outside of O’Shaughnessy Hall, at the Ivan Mestrovic sculpture of Christ and the Samaritan woman at the well. The corresponding Gospel passage was read during the service and Father Jenkins noted the importance of that passage as it relates to today’s political circumstances. He told the crowd, “We now have elected leaders and we should pray for them and, as far as we can in accord with our principles, cooperate with them to serve the common good. We also pray for those holding opposing positions that they might continue to be engaged and that their voices continue to be heard. I do not want to minimize the very real differences in perspectives and principles that divide us. Yet I believe there is no peaceful, fruitful future for us except through the respectful, constructive dialogue that is so critical for a democracy. “Dialogue, one can argue, is the central activity of any university community. We can disagree passionately, but we should not demean our opponents. We should state our convictions, but we should listen to all, and most attentively to those who do not share our views. It is the responsibility of each of us to foster a conversation that engages and enlightens, rather than descends to mutual recrimination,” Father Jenkins continued. He stressed, “At Notre Dame, we must never allow any election cycle, law or policy to make us forget what we stand for.” Those things, he said, include respecting the dignity and worth of every person, committing to work toward the common good and standing in solidarity with every person, particularly the most vulnerable and marginalized. “That is Notre Dame. Either we walk together in mutual support, or we do not walk at all. Either we are all Notre Dame, or none of us are,” he said. Also participating in the service were the Notre Dame Liturgical Choir, Voices of Faith Gospel Choir and Coro Primavera. Read Father Jenkins’ complete remarks at President.nd.edu. Originally published by Sue Lister at news.nd.edu on November 14, 2016.